Games are more than games. The games of childhood remembered become metaphors for our younger life. Running, skipping, hopping are early years, then comes the more sophisticated hide-and-seek and next along tag and hopscotch. Finally, just before adulthood there's kiss-chase and truth or dare. Board games and cards also tend to come in life stages: starting with the enthusiasm of snap, we're shortly into snakes and ladders and then the brutal pleasures of monopoly, pass go and we've arrived at chess. Today Lois brought in an armful of old board games including some that had been the property of her grandma Queenie, a keen and competitive games player. These beautifully boxed vintage games carried mysterious titles like Bezique and Lexicon. A wonderful Mah Jong set on close inspection had bone or ivory pieces (we couldn't tell which) while the cover on the time-worn box showed a scene from pre-Revolutionary China. 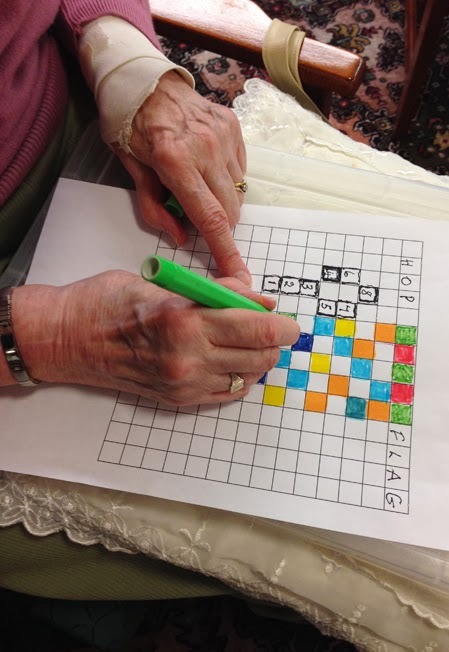 We passed around the games in the two groups we worked with - both of which included people with a dementia diagnosis. 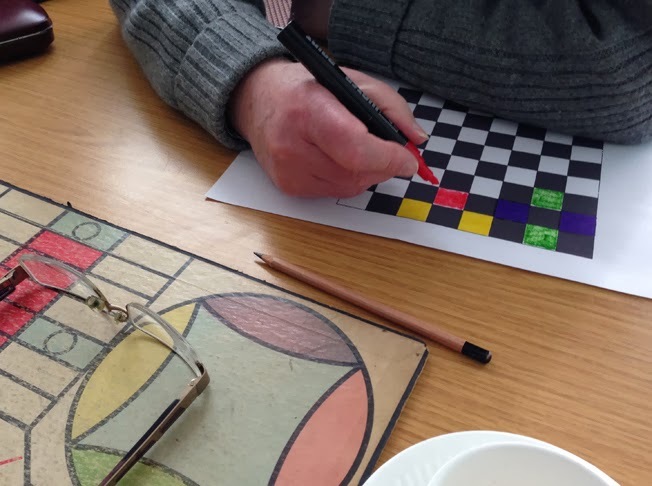 I noted the conversations, then folks interacted with game-like grids on paper, colouring abstract patterns or writing in the squares. 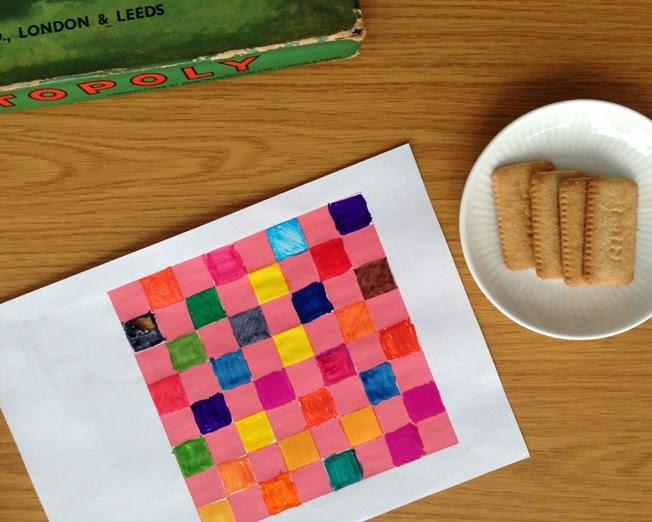 Polly Kaiser, who had invited us to work with a group she helps to convene at Royton commented on the pleasure of the conversation, and how we use it to build a safe space to remember and express. She also observed that post-structuralist ideas of non-linear reading work nicely here, the fragmentary found poem emerging from the conversation was rich and multi-valent. 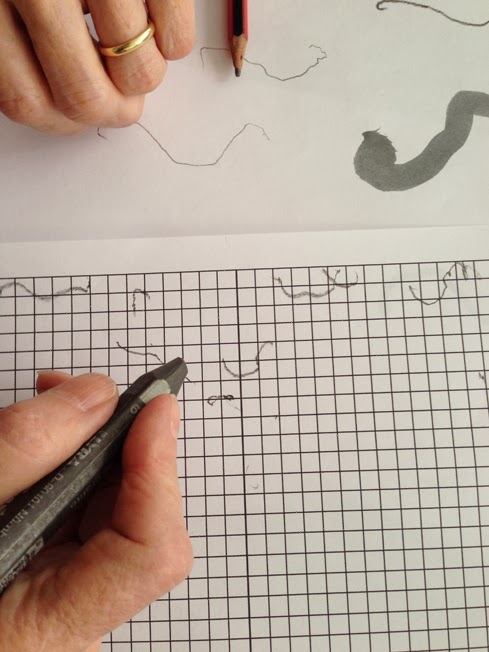 By allowing fluid logic into the poem-making process we perhaps free up creative space for people (such as those with dementia) who think along other shapes and pathways. Out of these marvellous items from Lois' gran flowed a conversation that hopscotched between memories as though they were still occurring right here in front of people's eyes, although in some opinions they happened many years past. I've put the poem below, but the most profound part of this workshop was the deeply-felt engagement with in-filling the grids with decorations of colour, snake-ish swirls, movement, creating sumptuous abstract/abstracted art.